Does it real magic like Bruce Lee did? Why the monks learn kung fu, they take it for defense, healthy or kill others? What we can benefits from Kung fu? If you’re interested in a form of training that emphasizes speed over strength, brains over brawn, bodyweight and simple tools over expensive gym equipment; If you want an alternative that would keep you in shape while teaching you new skills that would train mind as well as body, the kung fu is great chance you can try. Why People Like to Learn Kung Fu? The kung fu is a very traditional exercises and forms to strengthens the body and the mind. By variouse types of training and practing, different parts of your body will be awake up, you can control you body in a better way. When you learn Kung Fu, you will find that the practice is more than just kicking and punching time and time again. As you Doing the practice you can get a further understanding of the basics, the principles, the forms, the exercises, the applications, and all the understanding will make you know yourself in a new way. It is you who is doing the movements, and in time it may become more than something you “just” do. The understanding gained from long term practice becomes part of who you are. So learnning kung fu is not only body training, it is also a mind training, can make you touch the meaning of Chan. And futher more, the kung fu forms practicing can build your consciousness about how to control your body, make offence and defense in effective way. Doing martial arts is about mastering your body and mind, and pushing yourself to the limits of your abilities. It’s like the confidence training that the modern military puts its new soldiers through, yes, it can be a useful skill in certain circumstances, but it’s also a method of teaching the recruits that they can do and be more than they thought they could. As stated previously Kung Fu is originally a fighting art for defense. Each movement in Kung Fu is practical and can be used to defend against an attack. If you develop coordination and confidence, and you develop awareness. These aspects are essential when facing any situation. Of course the punches, kicks, joint locks, and throws are also helpful for girls to protect themselves. Here is Shaolin kung fu self defense techniques. Nowadays, more and more people like try kung fu exercises, and take it as a fashion workouts. Kung Fu training is more than just techniques, there have real reasons that some kung fu training is good for keep fit and body healthy. When people think about Kung Fu they might picture high kicks or acrobatic forms but that is only one aspect of what Kung Fu is. 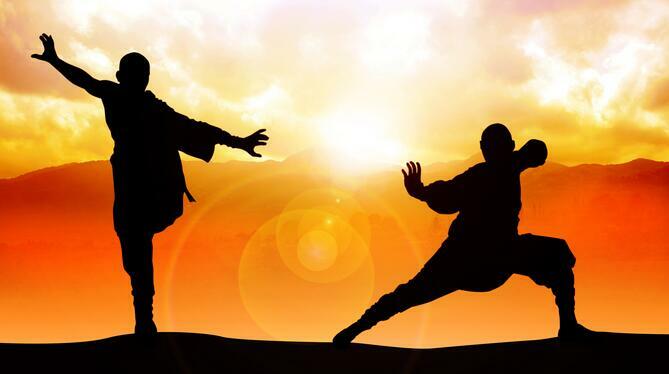 There are many styles of Kung Fu that can be considered low impact to train your body healthy. An example would be Tai Chi Chuan whcih is one of the soft or internal styles of Kung Fu. Other internal styles include Xing Yi Quan and Bagua Zhang. These internal arts are well known for their health benefits and are very popular throughout the world because of them. In addition many arts have exercises for improving health, flexibility, and for conditioning and strengthening different parts of the body. The benefits of kung fu learning are not exclusive, you can get some of the other benefits at same time. Only after your take time to learn kung fu, you are training, practing and thinking and you can feel the magic and truth of kung fu. There are many kung fu styles and types of China Martial arts, and the most popular and famous is shaolin kung fu. Keep reading, and you will see the legendary Shaolin Temple and Shaolin Kung fu. It means: An age-old temple is hidden in big mountain, and a clean spring lock the green forest. The mountain is Song Mountain, it have two big parts about Taishi and Shaoshi mountain. The forest is forest in Shaoshi mountain. Shaolin Temple is situated at Shaoshi Mountain in the west of Songshan Mountain ranges, in Dengfeng City, Henan Province, China. The Shaolin Temple was first built in 495 AD in the Northern Wei Dynasty for the Indian monk Batuo. Then another Indian monk Bodhidharma arrived at Shaolin temple, he meditated in one cave of shaoshi mountain and initiated Chan Buddhism. Thereafter, Shaolin Temple was recognized as the origin of Chan Buddhism. In the past thousands years, shaolin temple have been destroied and rebuilt several times. The ancient architechtural complex of Shaolin Temple comprise 7 main halls on its axis,flanked by several rooms on each side. It’s 160 meters wide and voer 360 meters long, covering and area of 57,600 square meters. The monastic live and deal with daily affairs in the temple. Now Shaolin temple is a hot tourist attraction, people from home and aboard will come to see the shaolin kung fu and search the truth of Chan buddhism by themselves. It’s very convenient for foreign people all over the world come and tour. It is known that martial arts have been practiced by monks at the Shaolin temple throughout its history, the monks training kung fu to keep healthy and defense. Bodhidharma developed the 18 boxing techniques of Shaolin and trained the monks to prepare their body condition willingly for the long meditations. The exercises should promote the health of the monks, the steely muscles and stimulate the internal organs, so they live longer. He also spreaded the Buddhist teachings of the Chan, which was very accommodating to the Chinese mentality. Authentic Shaolin Temple Monastic Kungfu monks teach traditional Kungfu techniques of Fist forms, Weaponry forms, Hard and soft Qigong. Basic Buddhism knowledge and practice (Chan order),Chinese Language, Chinese Calligraphy. Shaolin Medicine’s acupuncture, Tuina massage, bone setting will be also taught according to your condition. 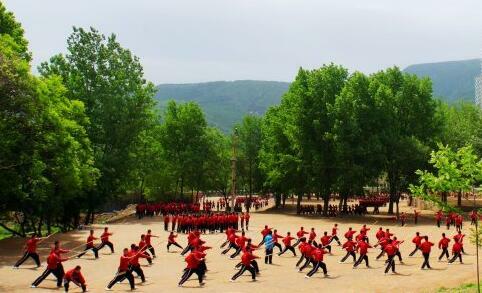 The kung fu training is part of the mokns’ life, but it is a method but not the purpose. 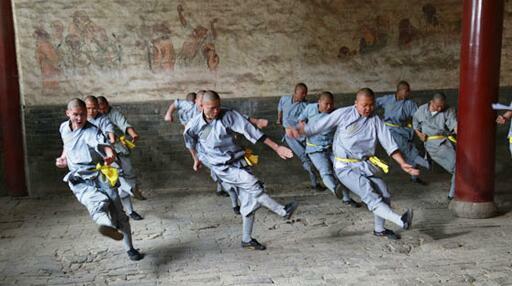 Click here for more about shaolin monks’ daily life and training. Chinese Kung Fu learning gains popularity mainly because of its emphasis on fitness, self-defence, make body healthier and strong your mind. Earlier days, people had to apprentice themselves to the martial arts masters. Nowadays, many training centers, clubs or schools are open to enrolling enthusiasts. Some people come to shaolin temple to learn shaolin kung fu, then when finished the learning, they build theri own schools to teach more people. The monks from shaolin temple spread kung fu in and aboard. If you like kung fu, you can learn local or come to China.